1Department of Animal Production, Faculty of Agriculture, Zagazig University. 2Central Laboratory for Aquaculture Research, Abbassa, Agriculture Research Center. This experiment was carried out in the Central Laboratory for Aquaculture Research from June to October 1997. A total number of 11400 fingerlings were used in this work. Such number included 7200 Nile tilapia, 3600 common carp and 600 grass carp. The fish were divided into six experimental groups. Polyculture system was carried out in the present experiment. Six earthen ponds (20X50m, 1000m2) were used in this study. Three ponds were fertilized with inorganic fertilization, while the other three ponds were left without inorganic fertilization. At the start of the experiment, each pond was fertilized with 50 kg chicken manure weekly per pond. The chemical composition of chicken manure was 18.5% crude protein, 12.2% crude fiber, 1.5% ether extract and 32.1% ash. The experimental diet was given at a rate of 3% of body weight per day. The ration was contained 15.9% crude protein, 10.6% crude fiber, 4.9% ether extract and 8.6% ash. The first three ponds were weekly fertilized with 2.5 kg urea (46% N) and 5 Kg superphosphate (15.5 CP) as the chemical fertilizer per pond, while the other three ponds didn't receive any chemical fertilizer. Fish samples were taken randomly biweekly from each pond.Within each fertilization system and feeding system, the first pond was stocked with 900 Nile tilapia, 900 common carp and 200 grass carp (45, 45 and 10% stocking ratio, respectively; 1:1 tilapia : common carp). The second pond was stocked with 1200 Tilapia, 600 common carp and 200 grass carp (60, 30 and 10%-stocking ratio, respectively; 2:1 tilapia to common carp). The third pond was stocked with 1500 tilapia, 300 common carp and 200 grass carp (75. 15 and ] 0% stocking ratio, respectively; 5:1 tilapia to common carp. Water quality of the ponds was measured daily. The obtained results can be summarized as follows:■ Phytoplankton and zooplankton increased as affected with chemical fertilization. Stocking ratio I tilapia: 1 common carp recorded higher phytoplankton and zooplankton, while the ratio 5 tilapia: 1 common carp recorded lower phytoplankton and zooplankton in each fertilized and non-fertilized pond. Water temperature was not affected with fertilizers or stocking ratio. Concentration of dissolved oxygen in water ponds increased with chemical fertilizer under all stocking ratios. Values of pH, total hardness, total nitrogen and total phosphorus concentration increased with chemical fertilization than those without chemical fertilizers. On the other hand, increasing tilapia density decreased total nitrogen concentration-Fish body weight increased significantly (P<0.05) in chemical fertilization treatments during the whole experiment. 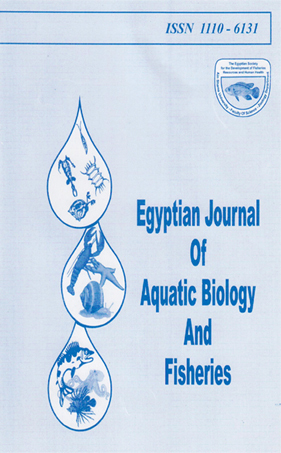 Nile tilapia showed the highest responses to chemical fertilization. Fish live body weight, body length or condition factor were not affected significantly with stocking ratio.